Cessna’s Citation X exceeded everyone’s expectations in becoming the fastest jet in the private aircraft industry. During the first year of its debut, the Citation was awarded the Collier Trophy for advances it had made in aviation and aerospace technology. 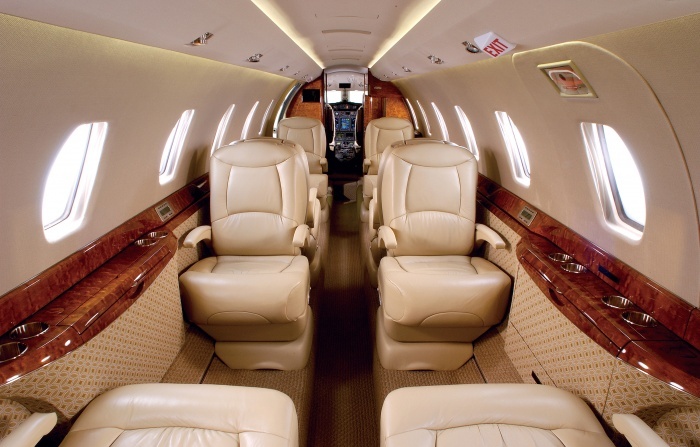 The cabin of the Citation X features a length of 25.2 feet, a width of 5.5 feet, and a height of 5.7 feet. These measurements allow passengers optimal room to move about the cabin, conduct business meetings, and relax. The cabin also seats up to 9 passengers in large, comfortable executive style seating with full recline capabilities. The full galley accompanies catering trays and fine china all within arms reach. The large washroom is located behind sliding doors and is equipped with a vanity. The lavatory has ample room to double as a dressing room and holds a closet large enough to store garment bags. To prevent damage during flight, the baggage compartment is heated and pressurized, holding approximately 770 pounds of luggage within 82 cubic feet.